The campaign for the Saatchi Bill has been, at its heart, an advertising campaign. And, as we shall see, it has been an extremely successful one. If there are awards for this sort of campaigning, the bill team deserve one, because they have been very adept at driving the debate in the direction they want it driven and in garnering petition responses that give them the answer they are looking for. Unfortunately, campaigners for the bill have repeatedly made claims which are demonstrably not true, which I’ve covered here, here, here, here and here, so it is arguable that the consultation process has been significantly undermined as a result. The consultation has been undermined in other ways. I’ve strongly criticised the Saatchi Bill campaign for running additional means of responding to the consultation via their own web page, for failing to respond to questions about how they were using the data they were gathering, or even explain what they meant when they announced various figures for how people had responded. I think this lack of clarity has seriously muddied the waters. When I wrote about this in my guest blog post for the Guardian, they didn’t make any attempt to put right their lack of response to questions; instead they asked for the comments to be removed. I think this goes some way towards demonstrating my point about the lack of transparency in the consultation. But why am I still going on about this? Well, for starters, the claim that there has been an overwhelming positive response to the consultation is the centrepiece of the briefing document being used to push the Saatchi Bill forward. If it turns out that there are problems with the way those responses were gathered, it would affect how we view the bill. I intend to show here that there are indeed problems. Secondly, the Saatchi bill is being pushed ahead without waiting for the Department of Health (DoH) to publish the responses it received in its consultation. There seems to me to be no good reason why one would have a consultation and then not wait for its results to be publicly available. 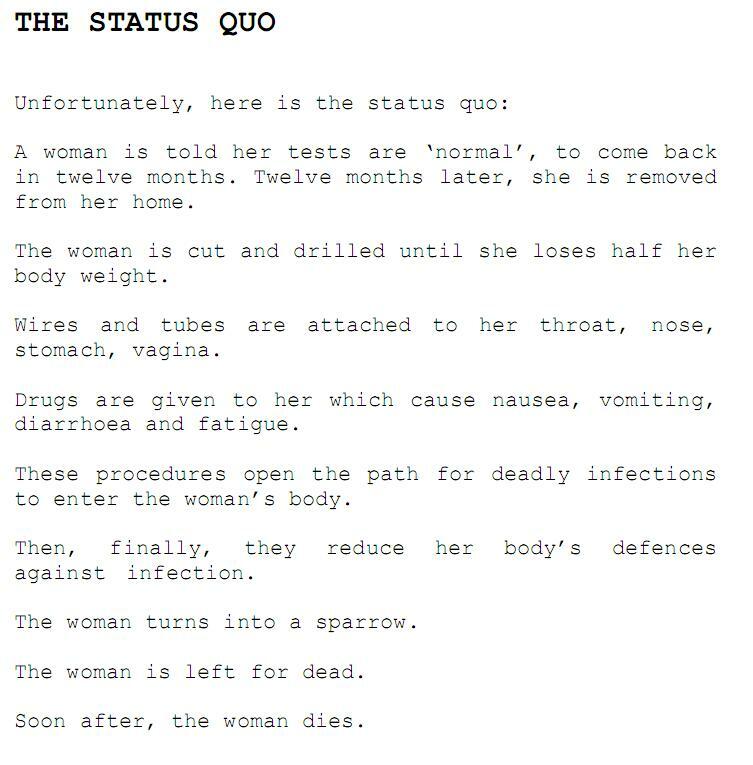 I want to look here at one possible reason why the Saatchi campaign are not waiting for the Department of Health to finish analysing the feedback they have received. This post examines the various ways in which individuals and organisations were able to put forward their views, and contrasts the responses given when respondents were exposed to campaign information with how they responded when given information directly by the Department of Health. Because the DoH’s results have not yet been published, I will have to do the best I can with what is available. I’m sorry this post is rather long, but I think it is worth it if you want to see how it is possible to subvert a public consultation to make the public say what you want them to say. There were two main directions from which an organisation or individual could come at this bill. For many – probably most – people, they would have found out about the bill through advance campaigning via patient and charity groups, via articles in such places as the Daily Telegraph, and via the bill’s busy promotion on social media such as Facebook and Twitter. This promotion was misleading from the outset. It was not made clear that Dominic Nutt, when writing in glowing terms about the bill in the Telegraph, was the bill’s Communications Director, nor that the Telegraph was the bill’s “media partner”. If you write an “advertorial” about a product in a newspaper or magazine, you are required to label it as an “advertising feature”. Not so, it seems, if you are advertising a parliamentary bill, where behaviour bordering on astroturfing appears to be considered acceptable practice. Campaigning by the Saatchi Bill team was very much characterised by a clear message that this bill would, if passed, give us a cure for cancer. So, as a respondent coming via this route, you would have had the opportunity to answer the yes/no question “Do you want this bill to become law?” and add a comment as to why it was important to you. This response would then be sent off to the DoH on your behalf, while the Saatchi campaign picked up a copy. I’m going to leave to one side that this process is a little bit like saying “If you’re not happy with your waiter, tell the waiter, and he will tell his boss all about your complaint”. Because there’s a bigger problem, which I’ll come to in a moment. The other possible “Saatchi” approach would be to sign a change.org petition the campaign was simultaneously running. So here’s the problem. It’s entirely possible, indeed probable, that a reader could get to the point of signing the petition or completing the Saatchi web form, without ever once having read the bill itself. The bill is not easy to locate on the Saatchi bill’s campaign page, one has to wade through a lot of bill-positive spin to reach it, and it’s not on the change.org petition page at all. There’s no encouragement to read the text, the emphasis is far more on reading the stories of people who have been affected by serious illnesses and their pleas that you sign up. A reader would almost certainly end up relying entirely on what the Saatchi campaign tells them about the bill. As we’ve seen, the claims made for the bill are very different from the reality of the bill. According to the latest briefing note, there were 18535 responses via the web form and the petition combined. (I am grateful to the Alliance for Natural Health for spotting that the Saatchi campaign has included the petition results in their overall figures. I had not spotted this fact, and the realisation that a bunch of woo-merchants managed on this occasion to demonstrate better comprehension skills than I did was a salutary moment, I can tell you.) Of the 18535 respondents, both website and petition, 18502 were reportedly in favour and 33 were against. Of course, petition readers can’t register an opposing vote. How many of these responses were actually from the petition, and how many from the web form? I don’t think that has been revealed, but since the change.org petition stands at 18006 supporters today, it’s safe to say that the vast majority of the count is from the petition, where respondents weren’t offered an opportunity to read or advised to read the bill before they were asked to sign to support it. Yes, that certainly looks overwhelmingly positive at the moment. However, nobody outside the Saatchi team (and the DoH if the claims that all responses went also to the DoH automatically are correct) has seen the actual responses, apart from some cherry-picked quotes used in the latest briefing note, and we still haven’t seen what’s in the DoH responses. Another problem here is that it is likely that there are very many duplicates – people who signed both the petition and the Saatchi web form. If I had been a supporter, I would have done so. There is no indication that these are two different aspects of the same process, so no apparent reason why you shouldn’t sign both. There’s no mention of the Saatchi tumblr page, or of the petition, yet these are now being described by the Saatchi team as if they were the chief part of the consultation. These additional avenues were presumably added later, after the DoH consultation document was written. And that brings us to another interesting aside. In their latest briefing and in the Telegraph, the Saatchi Bill team rely on that figure of 18535 responses to support their claim that support was overwhelming, that the bill has struck a nerve, by having a level of response much higher than would normally have been expected. I suspect that the DoH would have been referring to consultation responses, and personally I don’t think it’s appropriate to add the results of the petition to the figure, partly because this is a petition, and partly because the DoH can’t have had it in mind when they gave the Saatchi team that figure. 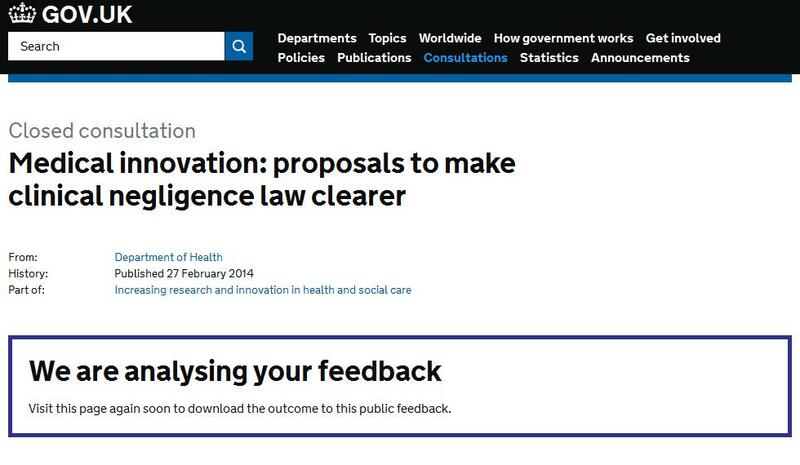 If you recall, their published consultation methods were via questionnaire, e-mail or post direct to the DoH, with no mention of either the Saatchi website or the petition, and there were 170 respondents by that route. Even if you add in the respondents from the Saatchi web form, that still only adds around another 500-600, hardly overwhelming. The draft bill was right there for you to read, clearly signposted, in a document on its own, not hemmed in by dozens of pages of “briefing notes”. 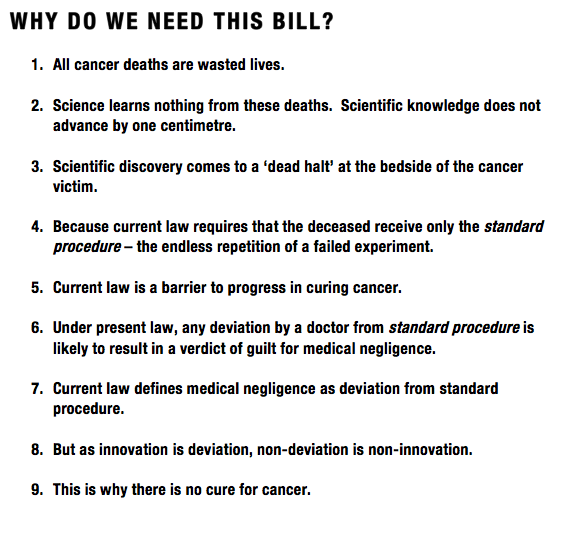 There were notes available, but again they were far more neutral, focussing more on rising costs of medical negligence litigation (arguably a different issue) than on confidently trumpeting the bill as a cure for cancer. 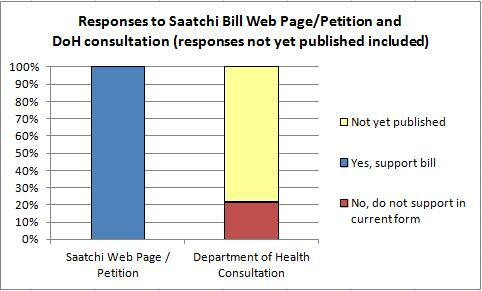 According to the latest briefing note from the Saatchi team, 170 people responded via the DoH consultation route. This cannot currently be checked, because the results have not yet been published, but I think it would be valuable to see if we can work out anything from the responses we do have. 1) Yes, support the bill in its current form. 2) No, do not support the bill in its current form. To be absolutely clear, the respondents in the No category either said they did not support the bill at all, or their support was conditional on significant change. This is, I believe, the closest I can get to a binary answer as offered via the “Saatchi” route. The only exception is that I have interpreted this page from the Alliance for Natural Health to mean that they originally responded in support of the bill. Of my sample of 37, 36 didn’t support the bill. 1 respondent (the ANH) did. I’m not sure how to graph this, so I’m going to describe the DoH consultation responses in two ways. Depending on whether you think it’s safe to extrapolate from the sample of 37 to the entire population of 170, whether you think the 37 I’ve found can be assumed to be representative, you can choose whichever version you prefer. I’m plotting percentages here, because I want particularly to look at the proportion of each group that responded positively or negatively. No opposing organisation was named or quoted. You’ll recall I’ve quoted some of them here. No wonder the bill’s promoters didn’t want to wait for the DoH analysis to be published, or to make any more than scant mention of it – it would have been poison to the bill. It would have shown that opposition was much stronger than the latest briefing notes would seem to imply, and that on the negative side were some very large, heavyweight organisations. 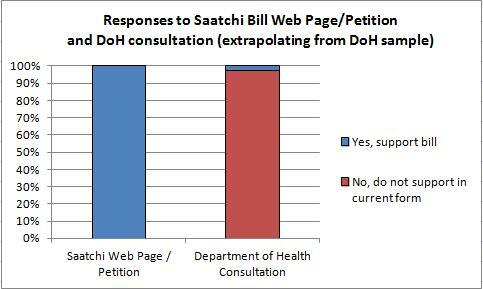 Based on the figures we have publicly available, you were at least 100 times more likely not to support the bill if you went via the DoH route than if you went the “Saatchi” route. When the full results are published, the disparity may turn out to be even bigger – as much as 500 times more likely to oppose if you got a chance to read the bill rather than the spin about the bill. You may have thought that how the bill was presented to people wouldn’t make much difference to their opinions of it or whether they supported it, you may have thought that people don’t fool easily. I hope I have shown you here how much effect the spin has had and therefore – since the spin has been based on untrue claims – how it has undermined the consultation process. People and organisations who responded to the DoH consultation via the route the DoH originally intended appear on the evidence currently available to have almost universally not supported the bill. Inject the spin and make it harder to read the bill itself, and the situation is almost completely reversed. This is how advertising works. Unfortunately, in this case, the sausage is rancid. Addendum 24th June 2014: Some further details have come to light. 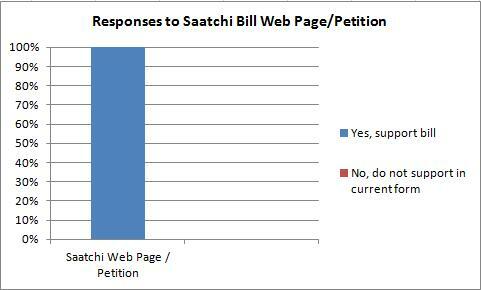 Firstly, the “Saatchi” responses were apparently split approximately 16000 petition and 2000 website. Secondly, the DoH have confirmed in an email to a colleague of mine that the Saatchi team have not had access to the responses to the official DoH consultation. This means they cannot know whether their latest draft addresses the concerns raised in the consultation – they haven’t seen it. Since I have found out from another source that they had written their new draft by 5th April – nearly three weeks before the consultation finished – they clearly haven’t used it to inform their rewrite. *I haven’t got round to going through every page of the original briefing note prepared by Lord Saatchi in detail, I suspect few people commenting on this bill have – it’s 104 pages. I wonder if other readers coming at it afresh, as I did, would be shocked, as I was, at what it contains? This seems to me to be less a briefing note on a bill and more a window into the mind of a deeply troubled individual. Lord Saatchi deserves our deepest sympathies for what he has gone through. But this is no way to make law.